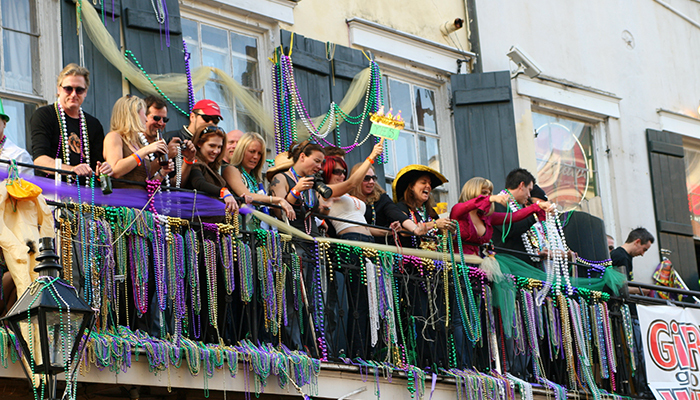 When it comes to incredible festivals, few in the world are as renowned or celebrated as Mardi Gras in New Orleans. 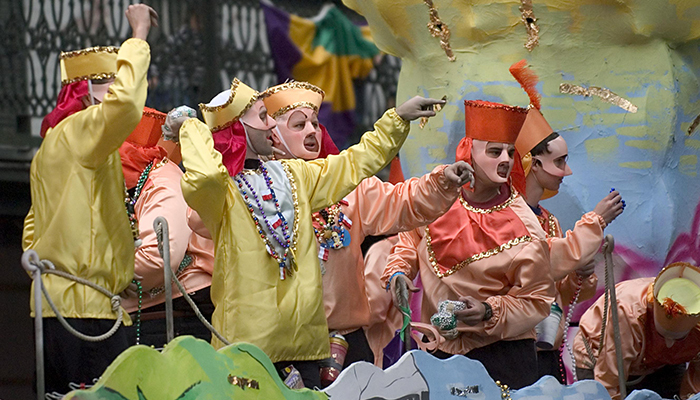 Residents and visitors alike go all out by participating in enormous parades, the size of which will stagger tourists. It's a colourful splendour that will make your cruise unique and inspiring, so try and time your holiday for a mid-February arrival in New Orleans if you can. 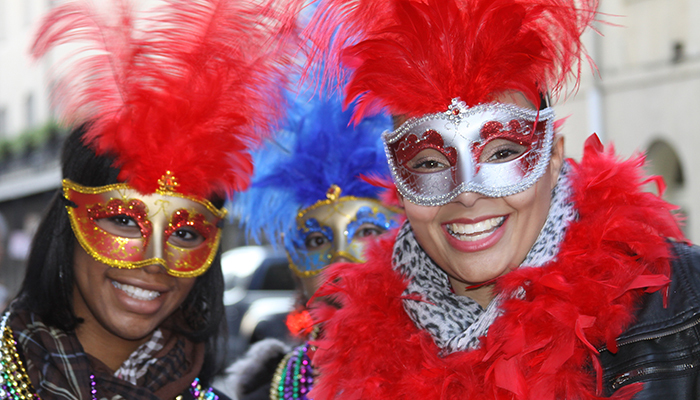 But what does Mardi Gras actually mean? The direct translation is Fat Tuesday - the last day of the celebrations - when residents are encouraged to enjoy themselves before participating in the religious period of abstinence - Lent. New Orleans has been famed for this celebration since 1835 - there is a truly incredible history here. 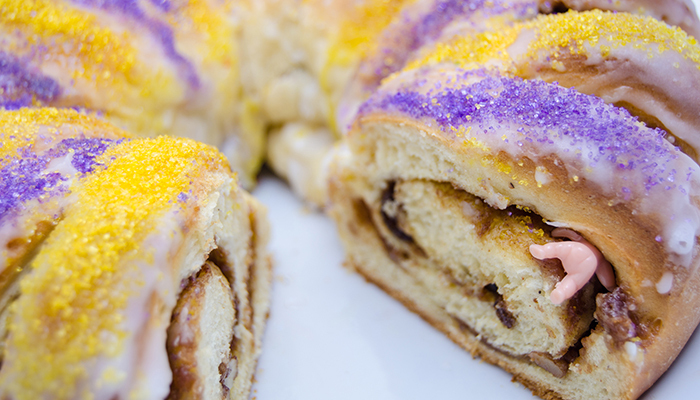 If there's one type of food that you have to try during Mardi Gras in New Orleans, it's king cake. This iced Danish-type doughnut is outrageously sweet, very much in keeping with the spirit of the festival itself. There is usually a little plastic doll to be found embedded in the top - a representation of Baby Jesus. The icing is usually as brightly coloured as possible and thousands of these cakes are consumed during the holiday period. Other foods usually consumed during Fat Tuesday include gumbo, a symbol of Creole cooking that is something of a staple in homes and restaurants across Louisiana. It is formed of a stew made with Andouille sausage and fillé powder - a thick sauce once used by the slaves to disguise the taste of the meat within. Bayou fried shrimp is another favourite - stalls can be found selling them along the parade route. Don't forget your tartar or cocktail dipping sauce! And, speaking of cocktails, you'll find a veritable smorgasbord of brightly coloured beverages available for consumption during Mardi Gras. The Tiger Paw, made from Southern Comfort, is among the more popular, but also be sure to try the Bourbon Slush, the Bahama Mama and the Red Rooster during your time in the city. But the best part of the festival is undoubtedly the atmosphere. If you're in New Orleans for Mardi Gras, you will likely come home with many more friends than you had when you left. The carnival feel helps the crowds to gel together and many people end up partying late into the night with strangers. In short, you're in for a good time.